Sister Eileen Reilly provides an overview on the United Nations and Commission on the Status of Women at a workshop for attendees. As the School Sisters of Notre Dame delegation on Sunday prepared for the opening of the 60th Commission on the Status of Women (CSW), Sister Eileen Reilly, SSND, presented an orientation workshop for the adults accompanying attendees at the Working Group on Girls Teen Orientation. 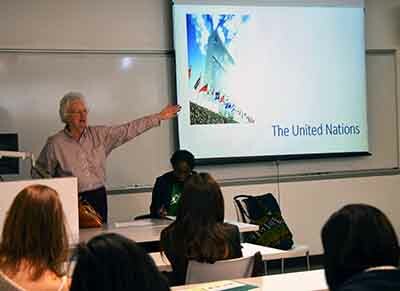 Sister Eileen, who is the director of the SSND UN-NGO office, provided background and history on the founding of the United Nations in 1945 and how the creation of the CSW fits into the U.N. Charter’s commitment to promoting social progress. When the CSW was founded in 1946, its purpose was to raise the status of women, and the 15 founders were talking about issues such as women in parliament and equal pay for equal work. There are also new issues today, including the prohibition on women driving in Saudi Arabia and the countries that ban women from owning property, Sister Eileen noted. The 17 Sustainable Development Goals are the focus of this year’s Commission on the Status of Women. The issues facing women today are reflected in the Sustainable Development Goals, which are backdrop for everything taking place at the CSW this year, Sister Eileen said. The United Nations adopted the 17 goals in 2015, which aim to end poverty, protect the planet, and ensure prosperity for all. Each goal has specific targets to be achieved over the next 15 years. 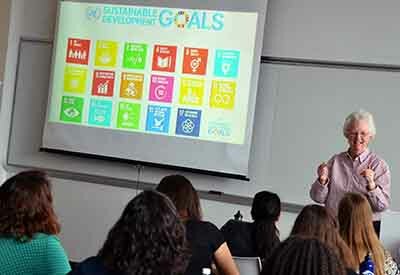 While at the CSW this week, the SSND delegation, which includes students from Mount Mary University in Milwaukee, will participate in round table discussions, interactive dialogues, panel discussions and side events organized by stakeholders to draw attention to critical aspects of the work on gender equality.